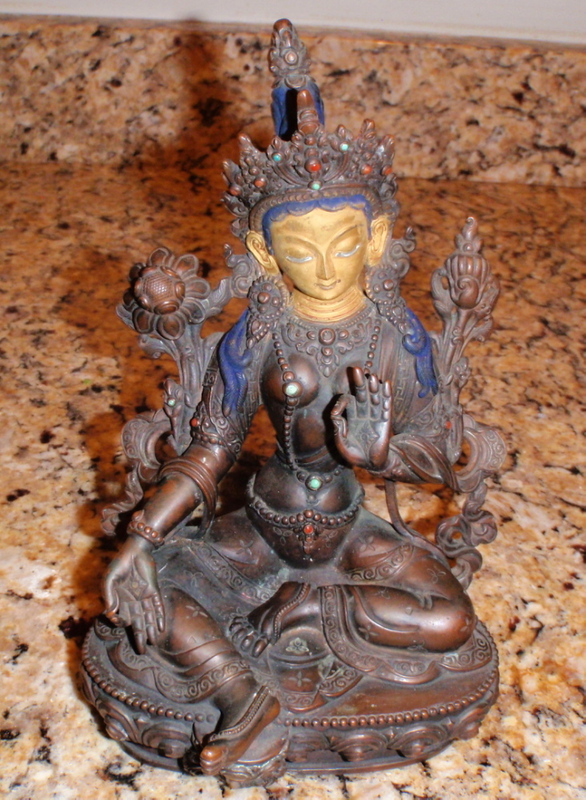 Subject:Cast Bronze Nepali Green Tara Sculpture - Maker? Hello. My brother brought this statue back from a trip to Mt. Everest in 1984. I know this is not an old antique, but it is not a modern reproduction, either. I would love to have an idea of when this might have been made, and by whom? Is it possible that the insignia stamped on the bottom, says something about who the maker was, or the year of manufacture? Are there ways to confirm that this is a Lost Wax casting? 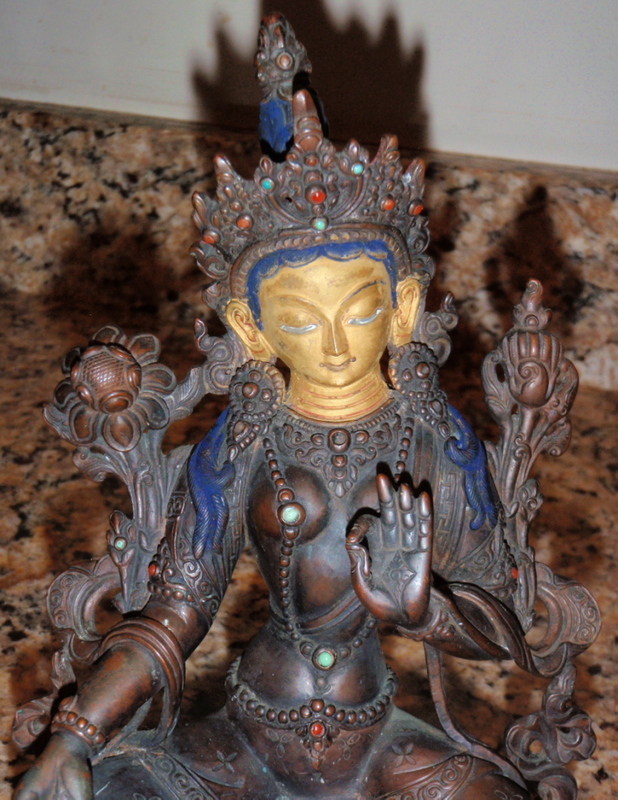 Subject:Re: Cast Bronze Nepali Green Tara Sculpture - Maker? This Buddhist and is likely from Nepal (or possibly Tibet). It's a common version of the deity Tara. It's in bronze with polychrome mineral pigments painted on the face. 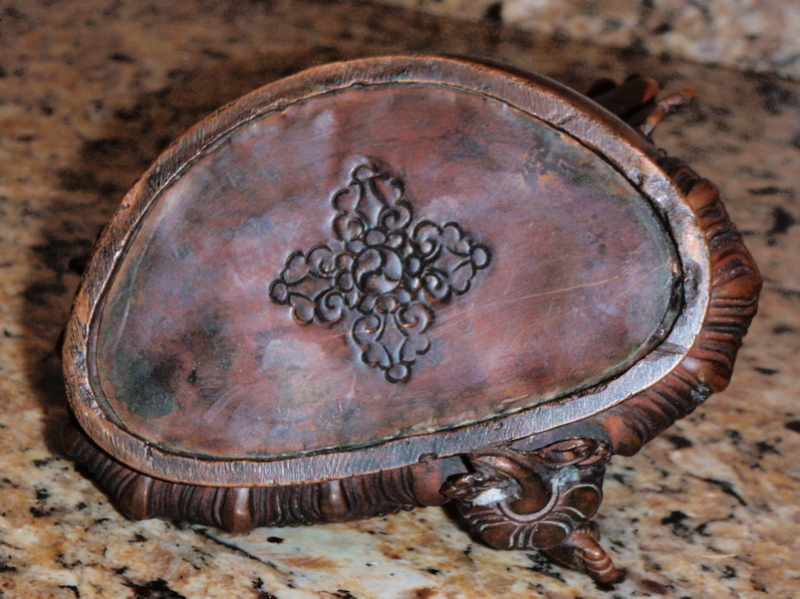 This is relatively modern, probably made around the time your brother bought the piece. The markings on the bottom is the double vajra, which is the typical marking on the bottom of these statues. It symbolizes lighting and energy. Behind the plate on the bottom inside the statue are likely Buddhist relics, texts, and various items to sanctify the statue.